This new take on the BLT swaps out the bread for flour tortillas and adds a dollop of guacamole. Spread each tortilla on one side with some cream cheese; top with some salsa and shredded lettuce and spread evenly. 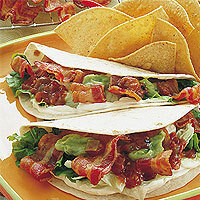 Place three slices bacon on each tortilla; top with some guacamole and roll up to serve immediately.